The most powerful known underground river in the world is Aouk-Kladuk Underground River in the Bird’s Head Peninsula of New Guinea. 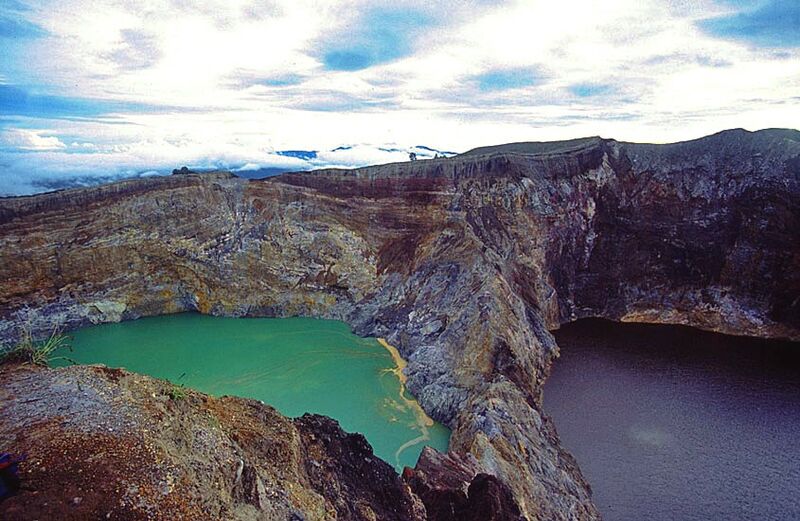 The western extension of New Guinea island is Bird’s Head peninsula or if used Dutch toponym – Vogelkop. Most of this peninsula is covered with pristine rainforest, sparsely populated and seldom visited by travelers and scientists. Bird’s Head peninsula receives lots of rain – some 6 meters per year. Thus the peninsula has several quite powerful rivers. In the central part of Bird’s Head peninsula is Ayamaru Plateau – limestone massif where intense karst processes take place. Here nature has created caves, sinkholes, and other interesting karst formations. Rivers in Ayamaru Plateau often disappear under mountain ridges and reappear in the other side. If these rivers are seen even on satellite images through the thick canopy of rainforest – these should be fairly large streams which should form enormous caves. One of such rivers is the 250 km long Aouk River, which in lover reaches is called Kladuk or Keladoet. 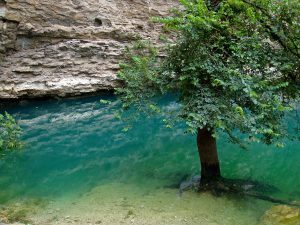 It has several such underground sections, including the giant Aouk Underground River in its middle part. River collects precipitation from more than 4000 km2 large area and in its lower reaches has a discharge of 300 m3/s – some five times more than, for example, Thames River. Local people knew about this subterranean river long, long ago. Scientists and researchers of modern times though came much, much later. The first known European in this area was Italian researcher Odoardo Beccari in 1873 – 1875. The first known European to reach the mighty resurgence of Kladuk River was the Dutch lieutenant Gustav Ilgen with a team of explorers in 1913 or 1914. He even took images of one of the entrances in the tunnel. Only in 2016 – 2018 in this area came the next explorers – the group of Italian Acheloos Geo Exploring. This research took place under the framework of a project “Call for River” – a quest to find the world’s largest underground rivers. Civilization has reached this area: there has been built a road over the Aouk-Kladuk Underground River and first houses appear around it. Nevertheless, this still is a comparatively pristine area with extensive rainforest. Aouk River enters the underground through a wide, arch-shaped entrance in the cave – Ilgen Sink. The river here is seemingly calm and lots of floating wood have accrued at the entrance in the cave. 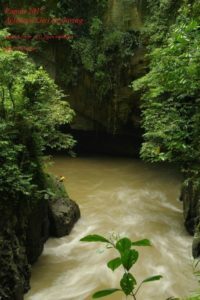 Nevertheless, it is too complicated to enter the cave – the stream is strong, there are no shores and flash floods come here frequently. Who knows – maybe inside the cave is siphon and anyone coming with a boat would die without hope for rescue. The other end of the cave some 1.5 km to the south is more dramatic. First comes a giant sinkhole – Kladuk Abyss – where the stream of the river opens through a window, roaring far, far below the forest. Then river slides under the ground again and reappears some 100 – 150 m further as a world’s most powerful spring, roaring and forming huge standing waves. Well, formally river resurgence is not considered to be a true spring. But it definitely looks like one – a giant stream coming from the underground and bringing some 130 – 180 cubic meters every second. This is some 6 – 10 times more than in the most powerful springs of Florida – some of the best known and most powerful karst springs in the world. 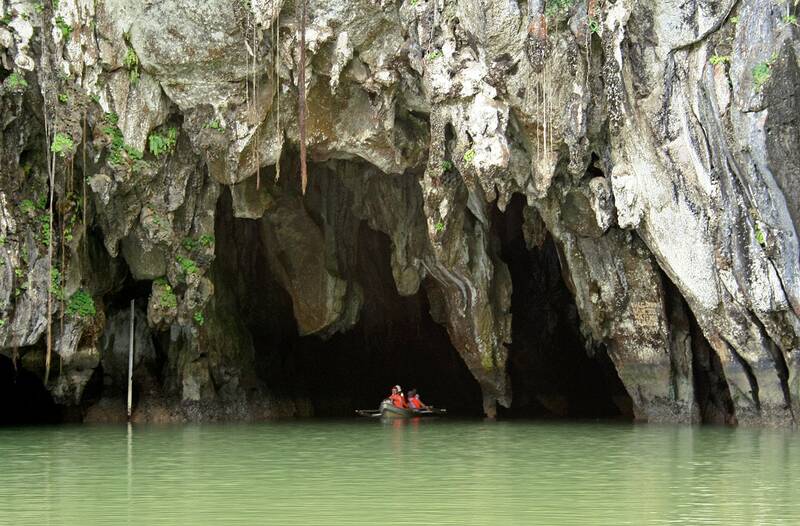 Aouk-Kladuk Underground River exceeds the size of world’s largest known cave rivers in Khoun Xe Cave (Laos) and Gebihe system (China) and currently is the largest in the world. Many thanks to Andrea Benassi for providing the information and granting the images to Wondermondo!